I tried a few recipes of brussels sprouts, with blue cheese, beshemel sauce, cheddar cheese..but this is the one we really liked. Baby tomatoes, olive oil, fresh lemon juice and garnished with feta cheese. 1/2 cup olive oil, 2 tsp sugar, 2 cloves garlic, fresh lemon juice, crushed feta cheese. Trim brussel sprouts, cut in half. Boil 8- 10 minutes in salted, vinegered water. Set aside. In a medium pan, put olive oil, onion and garlic. Cook until soft. 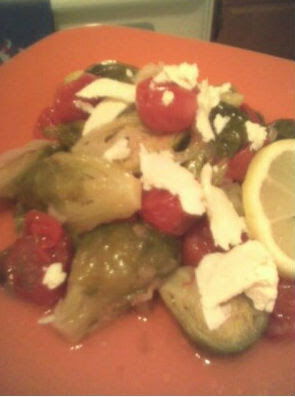 Toss the onion mixture with tomatoes and brussel sprouts. Add fresh lemon juice, sugar. Serve with crushed feta cheese and lemon juice. We always add extra lemon juice. Today was crazy! I came home late and thinking what can I cook? Checked the pantry. 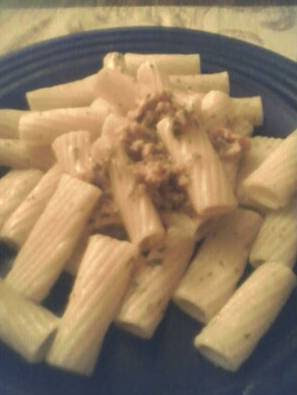 Grapped a pasta and find a sauce even I forgot it was there. White clam sauce. And salad whatever I have in refrigerator. 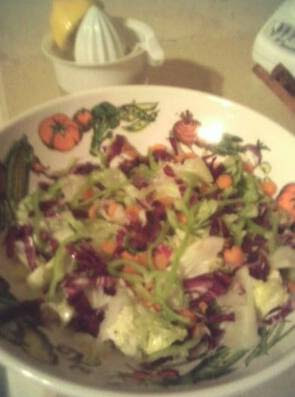 Iceberg lettuce, red cabbage, carrot, green bell pepper, olive oil and lemon juice. Core the peppers by cutting lengthwise, around the stem, seeds and ribs. Preheat the grill on high. Brush the peppers with oil. Meanwhile rest of the ingredients, put in a sauce pan and cook a few minutes. Place the peppers servis plate and pour the sauce on them. We love mint. But also oregano and basil goes great in tomato sauce. Up to you! Sometimes I use different kind peppers. 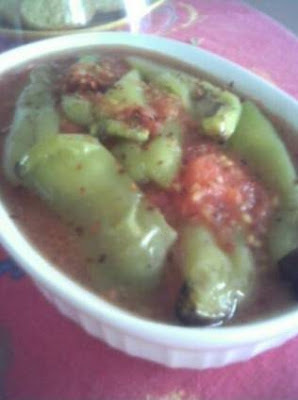 Bell peppers, hot peppers..Enjoy!